The Boston Bruins are busy before the draft on Friday. After trading defenseman Dougie Hamilton to the Calgary Flames, GM Don Sweeney has re-signed defenseman Adam McQuaid to a four-year deal with an AAV of $2.75 million, according to TSN’s Bob McKenzie. 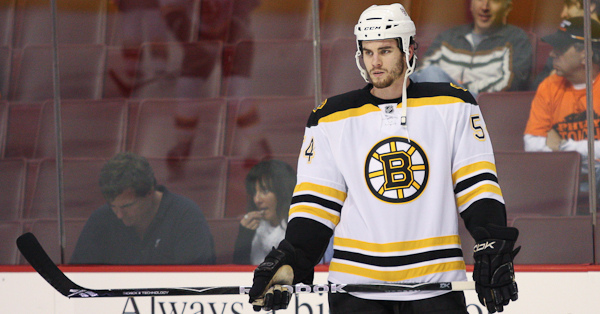 McQuaid, 28, is coming off a three-year deal with an AAV of $1,566,666. McQuaid has posted a negative relative Corsi every year of the six years he’s played in the NHL, including a -3.1% CF%Rel last season, which was the worst among Bruins defensemen this side of Kevan Miller and Dennis Seidenberg. Through 63 games last season he had one goal and six assists. In the Bruins trade earlier in the day the team acquired three draft picks — a first and two seconds — from the Flames.